My work is conceptual. I began each piece with a question, usually related to human roles or relationships. I examine myths, symbols, and the origins of how we define ourselves. For me, art is a process of discovery where the work teaches me as much as I shape it. The language I use is the language of shape. I have discovered, through years of teaching and practice that sculptural expression takes its root in the symbolism of geometric form. The shapes I emphasize reflect a personal philosophy about my journey in life. The subjects I choose to sculpt are the landmarks that illuminate my path. Steel is exciting to me as a medium because it can have an exceptional softness in the final finish. I achieve a combination of organic forms and geometric shapes through the use of my MIG welder and my oxygedacetylene torch. I create my colors by applying acid patina and heat to the raw metal, after the form has been completed. 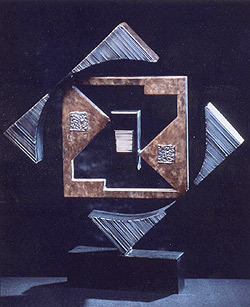 The combination of techniques allows me the freedom to explore relationships between emotional and intellectual responses to experience. 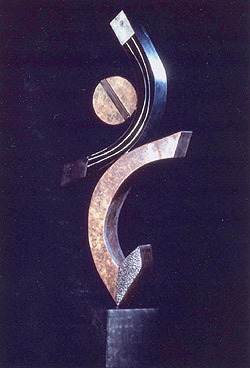 - 2004 The Softness of Steel," Solo show, Shidoni Gallery and Foundry, Santa Fe, NM. - 2004 Original Ann Arbor Street Art Fair, Ann Arbor, MI. - 2004 Uptown Fine Art Fair, Minneapolis, MN.